I can’t start another monthly favourites post with oh my god how are we already in *insert month* can i?? A lot of things changed in September, it was one of the most turbulent months of my life so far but one thing didn’t change: i bought new things, they’re pretty and i love them, thats all that really matters right? I have 5 favourites this month, 4 of them being makeup so lets start off with those! I picked up the freedom brow pomade £5 from superdrug at the beginning of the month and i’ve used it everyday i’ve worn makeup since. Before this i had never tried a brow pomade because i was scared they would look drawn on but i couldn’t have been more wrong. I use an angled brush (this doesn’t come with one) and it gives the most natural but defined brows, they don’t look powdery or too harsh and with 11 shades to choose from i got a really good colour match with “dark brown”. I had never owned anything Freedom before now but i’ll definitely be adding to my collection after trying this. Keeping it mid-range, this month theres only one eyeshadow palette i’ve been reaching for and thats the Zoeva cocoa blend palette. I love this so much i did a full review and swatches here. During September i’ve been mostly using a combination of “substitute for love” all over my lid, “freshly toasted” through my crease and one of the shimmer shades on top. Sometimes i’ve been just using the two shades above without any shimmer or just one of the shimmer shades like “pure ganache” all over the lid by itself which gives a beautiful natural all over shimmer. The shades in this palette are really warm toned so they make it a perfect everyday palette for A/W. This month i bought my first ever too faced products, yes i know i’m late to the party. One of my favourite things i picked up was the melted lipstick in chihuahua. I did think about getting a melted matte but i’ve got so many matte liquid lipsticks and i fancied buying something a little different that wasn’t going to leave my lips feeling dry. The melted lipsticks are a liquified long wear formula, so they’re still long wearing but have such a comfortable finish. 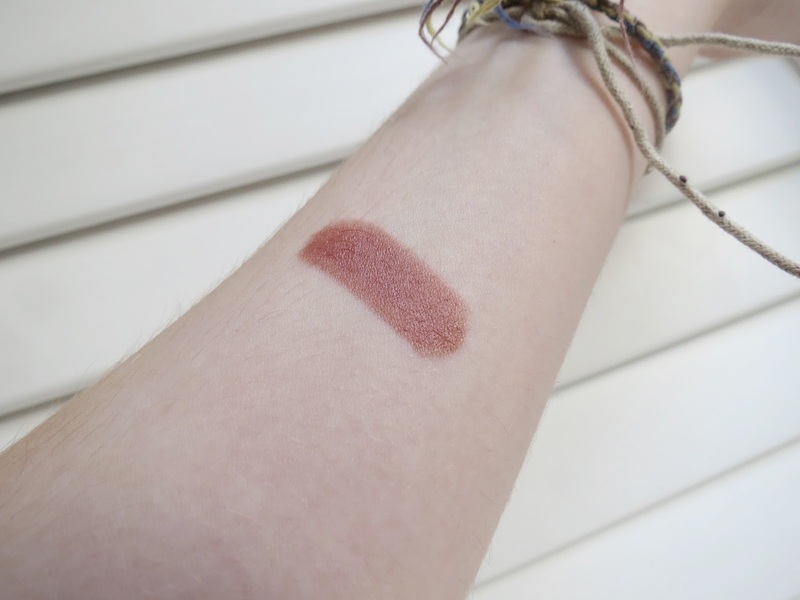 I love this, despite not being matte this isn’t shiny or glossy its a great in between finish which really lasts while being comfortable to wear on my lips. My last makeup purchase this month was the BECCA X JACLYN HILL champagne collection face palette, can we take a moment to appreciate how pretty this is??? When i bought it i took it out of the box to look at it and then put it straight back in because i was too scared of damaging it. Aesthetics aside it is a really good palette, champagne pop has overtaken mary loumanizer to become my go to highlight and with a very very light hand i dip into the blush shades to add some definition. One shade i don’t really use in the palette is the more bronzy shade(amaretto), its too warm for my pale skin but i don’t really mind because i use the rest of the palette so frequently. Swatched left to right: Rose spritz, amaretto, pample mouse, champagne pop, prosecco pop. My last favourite are these sunglasses i impulse bought for amazon, usually i’m really fussy about sunglasses because i’ve got a really small head so i usually stick to the same shape but i thought i’d branch out and buy these. They’re rose gold and mirrored.. do i need to say anymore? I think they’ll be so pretty on bright autumn days. Look for some serious instagram spam containing these in October. That Too Faced Melted lipstick looks beautiful!